“Hello! My name is Ben and I’m from Ghana. I like to…” then Ben slid his arm forward simulating the movements in a game of chess on an imaginary board. The circle of 30 strangers from around the world had to repeat Ben’s name, mimic his action, and then move on to the next person in the large circle. 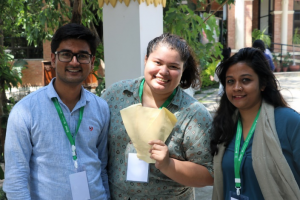 This initially embarrassing, but ultimately hilarious ice-breaker was the beginning of an engaging, demanding, and rewarding YouthMappers Fellows Leadership Workshop – the first of its kind – held in Kathmandu Nepal, in May, 2017. Faculty Facilitator, Richard Hinton’s, favorite activity – which is snowboarding. 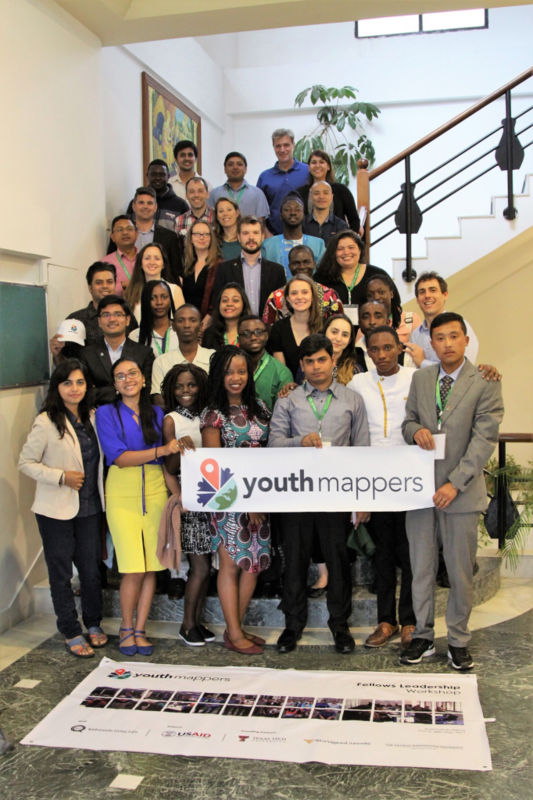 YouthMappers is a network of university-affiliated chapters from around the world (currently 67 chapters in 23 countries and growing!) which creates free and open geospatial data used to address specific development objectives in USAID affiliated countries. YouthMappers students create original, quality, localized geospatial data in unmapped places of the world to support local development goals, and to help communities prepare for disasters. 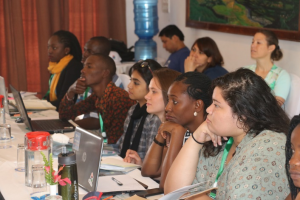 YouthMappers Fellows listen intently to instruction on research methodology (taught by Dr. Brent McCusker). 11 countries. 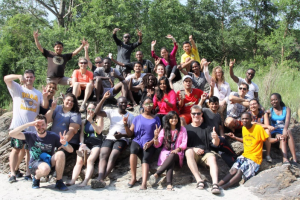 The 11 countries represented were: Bangladesh, Bhutan, Ghana, Kenya, Malawi, Nepal, Nicaragua, Nigeria, South Africa, Uganda, and the United States. Aside from some misdirected luggage, and a geographically illogical flight pattern from Bhutan to Nepal, the group converged – figuratively and literally without a hitch! During their eight days in Nepal, the YouthMappers Fellows received instruction in leadership, research methods, and geospatial techniques and implements, such as: JOSM, QGIS, mobile data collection, and Geocaching, among many other topics. In addition to formal instruction, the group had the pleasure of witnessing several presentations from our wonderful hosts, Kathmandu Living Labs (KLL), representatives from The United States Agency for International Development (USAID) Nepali mission (based in Kathmandu), and The USAID Geocenter from Washington D.C., which is the YouthMappers supporting agency. 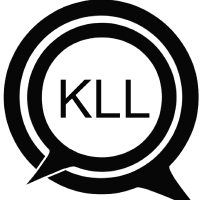 KLL is a civic mapping technology group in Nepal which strives to co-create digital tools and information infrastructure so that government, nonprofits, and businesses can use 21st century technology to provide everyday citizens with the best services. 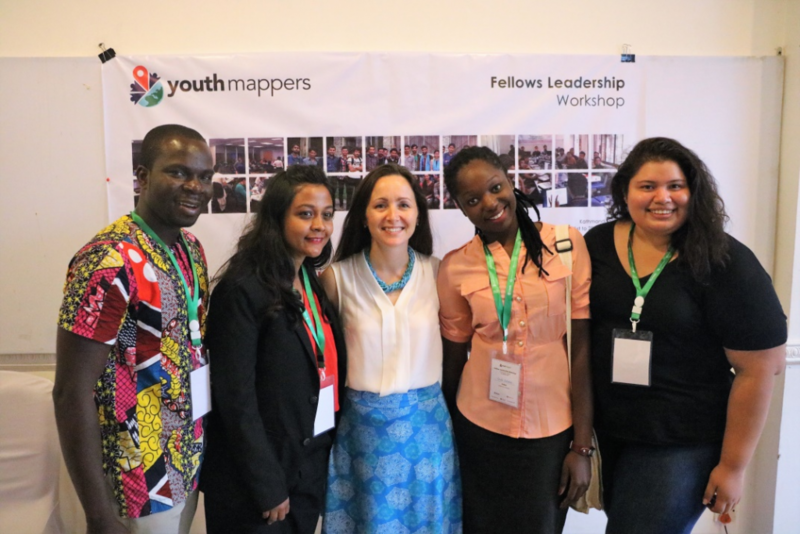 KLL served as the on-site host partners for this inaugural YouthMappers Fellows Workshop. 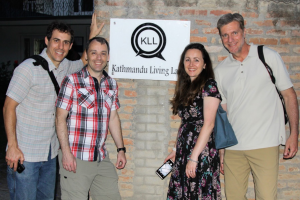 Their ebullient hospitality and attention to detail, which covered everything from technological needs for mapping projects to accommodations and incredible Nepali meals, led to the tremendous success of the Fellows Workshop. Geocaching winners, Saurav Gautam, Yasmila Saenz Herrera, and Maliha Binte Mohiuddin. Elijah Karanja Kingori, Temidayo Isaiah Oniosun, Bert Nii Odoi Manieson, and Frikan Erwee actively “shopping” for a project. One of the primary objectives of the workshop was for the students to actively engage in augmenting the capabilities and reach of YouthMappers. Students had to self-form groups based on interest categories. Students “shopped” for interest groupings in what workshop leader, Dr. Patricia Solis, called the “Marketplace of Ideas.” Once groups formed, students immediately went to work – brainstorming on how to enhance existing YouthMappers capabilities or how to add new facility to the organization. One of the group projects concerns the creation of a secure and voluntary database for the storage and use of YouthMappers chapter and member information. The team, led by GW Geography Professor Joe Dymond, presented this vision to the workshop group in hopes that the database will be used for chapter and individual networking, chapter alumni relations, and membership data maintenance among other purposes. provide closure to the OSM community, and to enhance formality and publicity for the academy. 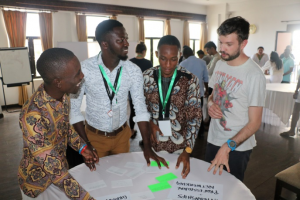 A final example is the team mentored by GW Geographer, Richard Hinton, which is working toward curating a library of capacity building resources tailored to YouthMappers. This team began working toward their project goals by identifying and reviewing existing Youthmappers resources and discerning what resource gaps exist in order to identify resource needs of the YouthMappers organization. There was much more than just hard work during the workshop. Students were taken on a tour of downtown Kathmandu, and treated to a traditional Newari cultural dinner and performance. 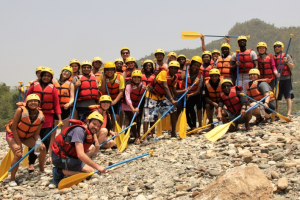 One of the highlights of the trip was a whitewater-rafting excursion down the Trishuuli River. Not only was this a teambuilding exercise in the extreme – but we closed the day with a hike to a local village to conduct mobile data collection training using vulnerability/damage assessments developed earlier in the week. 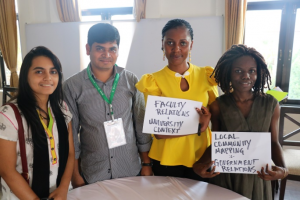 One of the most immediate and fulfilling outcomes of the workshop was the fast and firm friendships developed among the 20 YouthMappers Fellows. Students connected on the very first evening of the workshop and from that point through their tear-filled departures - they exchanged email addresses, became Facebook friends, followed each other on Twitter, and sent copious selfies to one another via Snapchat (we are confident that the selfie capital of the world was Kathmandu during the week of the workshop!). The friendships formed helped to create an instant YouthMappers Chapter network of leaders! One which will serve the organization well during the coming years and which will help to prepare and support a new generation of YouthMappers! ~ Joe Dymond, Nuala Cowan, and Richard Hinton are faculty of Geography and GIS at The George Washington University.